It has been a few weeks since my last update. The trout fishing is continuing along on its normal site. We do need rain; our local creeks and rivers are in desperate shape. All we had so far is a few thunderstorms. Problem with thunderstorms is that it is more of a hit and miss proposition. Despite the little bit of rain that some of us got, it had no effect at all on water flows. This past week was a tough week for trout fishing. Low water conditions make for ideal trout fishing conditions. Because of the heat and warm water temperatures. Most of the fishing happened at dark and into the night. This is mostly due to water temperatures and Fish feeling exposed. Bug activity is also influenced by this weather. Bug hatches that would normally expect to happen during daylight hours, are now happening at night. We definitely needed our night vision goggles last week. However once the hot weather cool off and water temperatures return to normal, we will be back to a normal afternoon fishing schedule. Starting with Oatka Creek, Genesee River and the surrounding creeks and rivers. The warm weather definitely brought out the bugs. Even though most of the hatches were happening after dark. We have been seeing a large variety of caddis ranging size from the small size 20 like caddis to the larger chocolate brown caddis that is around the size 12. Fishing caddis as always Challenge, because there’s always a variety of them on the water at any given time. As for mayflies, Sulfurs are in full swing along with Gray faxes, March frowns, of course you can always find few olives hatching. Ironically we have been having some of our best trout fishing on the Salmon River. The state of New York add some surplus fish and stack these fish in several locations along the river. Here on the Salmon River we have had her best success fishing a variety of caddis patterns. We have been fishing caddis both as dry flies and wet flies. The Salmon River not only can amazing Stone Fly River but also a great River for caddis. A quick reminder, tributary regulations do apply when fishing the salmon River. 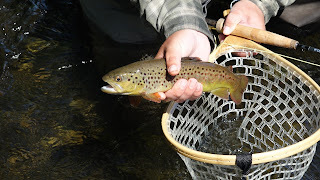 Brown trout must be at least 15 inches long to be kept and there is a three fish limit. Obviously I am going to encourage catch and release, we want the Good fishing to last. Also law-enforcement has been patrolling the River, reminding everybody of the regulations.